Ed. 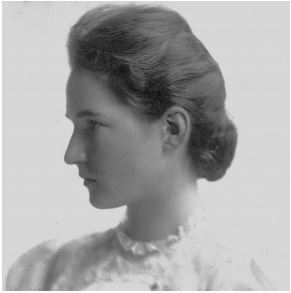 Note: Florence Guitteau (1885-1976) arrived on Mercer Island in the late fall of 1889 with her mother and younger sister Otella, who went by “Ollie”, joining her father, William Putnam Guitteau, who was already there. They left in late 1892 to return home to Wisconsin to care for her grandfather, returning once again in December, 1894. 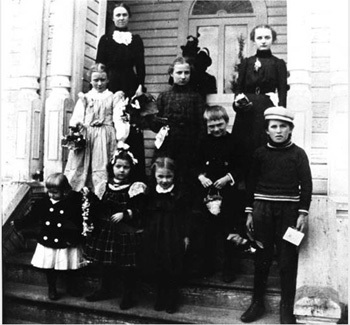 The family moved permanently to Seattle in 1902, returning during summer months intermittently. She recounts her early memories in this 1958 article. The many overgrown skid roads led to logged-off areas. The campsites were usually somewhere on the lakeshore. One was not far from our home. There were a few temporary structures: bunk houses, cookhouse with bunks for the cook and his helper, and sheds for the horses. The horses were used to yank the logs over the greased skid roads. After an area had been logged off, the camp moved on scows to the next place. It took only a year or so to make the skid road invaluable. Alder, vine maple and devil’s club grew fast. The logs the skid roads were made of rotted fast. It was hard to walk these roads. There was low overhead. Blackberries and red huckleberries grew on them, but were often hard to pick. Snakes sunned on them. Once my sisters and I, on our way from school to our home, saw a snake near the opening of one of these roads. Around her, nearby, were a dozen or so baby snakes. When we drew near, the mother snake opened her mouth. The babies went in one after the other, head to tail. When all were in, the mother slithered off down the old skid road. On our way home from school [in East Seattle] we usually ate portions of our lunches we had saved on purpose. One game we played as we walked along was to bite off equal sized pieces of bread crusts at the same time and see how far we could walk before we had to swallow. The road was lonely. There were no houses between East Seattle and our place. Seldom did we meet anyone. The one break in the road was a wooden bridge over a creek. Our father had supervised its construction. It was probably 30 feet long and about 10 feet above the creek somewhere near the middle of the decking. We were halfway home then. Some days I went alone to school, or alone on errands to East Seattle on a Saturday. It was so quiet the air drummed. I used to talk out loud, or say verses I had memorized, or whistle. Once I lost a silver dollar. I could never explain how, only I did not have it when I reached home and was asked for it. For all I know, it is still on the Island. We never found it. The school building in (Mercer) East Seattle was situated not far from the park where picnics were held. The road from the dock near the big hotel went straight to the park, then it turned, went past the school on the left. There was only one house beyond the school. The Morgans lived in it. Perdita and Pearla were the names of the little girls. Mrs. Morgan told my mother she read a book one time about children who had those names and liked them so well she decided to name her children after them if she ever had girls. There were three rooms in the school building: a large entry, the classroom and a room where supplies were kept. There was a stove. The teacher stoked it; she was janitor and wood-bring-in-ner. The school children were all little. I can’t remember any older than I, and I was nine. I recall these children: Edna and Rena Pidduck, Arthur Scott, a boy whose last name was Hilt, my sister Ollie. There must have been others, but I do not remember them. 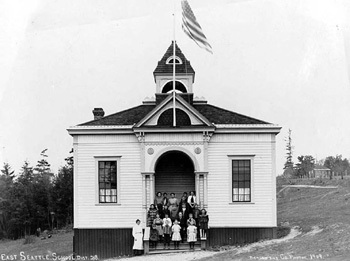 Mrs. Tousely says she did not attend the year I did, but attended the following year, the year I enrolled in the Pacific School on 12th and East Jefferson in Seattle, where Charles Fagan was principal. To determine in which grade to place me, he asked me what was eight times eight. I said 64 and was put into Mrs. Leslie’s fourth grade class. I was in that grade in Wisconsin again in East Seattle, and because I was home sick with measles when report cards were issued in May, and did not get one, when I entered Rainier School that next September, I had nothing to show – fourth grade again for me. Upstairs Goodspeed, teacher. Ollie had Downstairs Goodspeed. The teachers were sisters. Lucy was first grade; Mrs. Waughop, her teacher. I remember our first cow. She was a hooky cow. I was given the job of putting her out to pasture. This daily task involved putting a slip knot loop over her horns, keeping hold of the rope at the same time, then leading her to the pasture, (staking) removing the rope from her horns, and repeating the process in the late afternoon. My days and nights were filled with fear and dread and misgivings. I did so poorly I was relieved and Ollie, who was not afraid, took over, and enjoyed doing it. I was ashamed at having failed; at the same time I was relieved, and could sleep again. I liked very little of the life on the ranch. In that I was like my mother. Land clearing was hard work. Father said it cost $100 to clear an acre. Because there were few men available to fight land clearing fires that had gotten out of hand, not much was done put them out. His five acres were cleared by hand – an area here one year and put to grass, and so on, a slow laborious business. Wherever there had been a good burn, many times old snags o trees fell and fire got into the roots. Then it was not too hard to pull them out after a rain. Blackberries grew in profusion after a burn. They were used for pies and sauce during their season, and many quarts were put up and jelly made for winter use. Besides this small wild blackberry, there were black caps, thimbleberries, and huckleberries – red variety, salal and Oregon grape. When used together, the salal and Oregon grape made an unforgettable confection, a jelly the flavor of which is delicious. Some ladies had a way of making a dye, a fine yellow, from Oregon grape roots. The dye colored rug rags. Calkins' Landing at the end of Park St. I remember our first Christmas in Washington very well. We were living in East Seattle then occupying one of a row of identical houses to the right of and across the road from the big hotel. Father had two friends who were brothers, Al and Charlie Heisler, who were loggers and single. They came, dressed like Santa Claus and his helper, their arms laden with presents, to give us a Merry Christmas. Now, we weren't used to Santa Claus, Christmas trees, candles and so on. Father's people on his Mother's side, particularly, had arrived in Massachusetts colony in 1656 and did not hold to that sort of observance. They made more of Thanksgiving. So when the Heislers came through the door, shouting “Merry Christmas,” Ollie and I hid in Mother’s skirts and when she got us out, we fled underneath her treadle sewing machine and set up our own walls. Later, in the spring, we put our dolls’ heads on blocks, took rocks, and found out what wasn’t inside. We had as close neighbors a family by the name of Fuller. There were two big girls and a brother Tom and younger fry. Tom was a great friend of Alla Olds’s brother, David. He was with Tom in a rowboat when they decided to change seats. Somehow a gun they had went off and Tom was shot. l remember it was December 31, 1899 when the news was given out in Calvary Presbyterian Church, 24th South and King, during a Night Watch service. David died early too. Ruptured appendix and peritonitis. Not knowing, or understanding, hot compresses were used by the family when it was found the pain was allayed thereby. The second Christmas on the Island that I remember was several years later after we had returned from a three-year sojourn in Wisconsin and were living a mile and a half from East Seattle across the lsland on our own place. There was a Christmas program and party in the schoolhouse. I was to speak a piece, rather long, that I had memorized without understanding any of it. While waiting for my turn to come, growing more uneasy all the time, I whispered to Mother that I had to go. She gave me a little pat and a shove. I went out into the entry, then outdoors and around the “it’ll do” in the dark. On my way back who should loom out of the night at the corner of the schoolhouse but Santa Claus himself! I let out a volume of sound and a spurt of speed and, entering the schoolroom, threw myself upon my Mother, who, embarrassed, calmed me. Later, when my turn came, I spoke my piece. One of Mother's friends was a great reader. She was Aunty Workman who with her husband Charles Augustus lived back and up from the Sandells’. When she made a trip to Seattle, she was sure to bring back the latest English magazine, printed on pink paper like the old Police Gazettes, “The Family Journal,” it was called, and was full of short stories, one or two long ones, recipes and fashions. These magazines made the rounds too, also falling into my hands. I read everything. It reminds me of something I read recently. A group of people, one of whom was Somerset Maugham, was discussing what each would want on a lonely island in the ocean. When Mr. Maugham's turn came, he said, “Reading matter.” I agree, and my need of reading matter began away back when I was nine years old. I carried a Seattle Public Library card from 1897 to 1932. In 1897, the library occupied the old Yesler Mansion, somewhere near the County-City Building. After it was destroyed by fire, the old University Building was used. I had four books out at the time of that fire. I used to walk down Yesler Way to the Library and back the same way. It was not bad after one got up the hill on the way home. During the years 1896-1901 we - Mother, Ollie and Lucy and I - were in Seattle during the school year, and back to the Island [for] summers. We were then living on Calkins’ Place, or Guitteau's Landing, as the Luther Burbank School property was then known. The road that went by our place was not well kept up from our property on up the hill and further for some distance until it came to the Lucas ranch. There were no people living along that road. It was really only a wide trail. Alla Olds came that way whenever she called on us. It was adequate for a horse but not a team. Roads passing along ranches were kept up after a fashion, each man working out his poll tax. The road by Lucases and the Schmids and on down to the lake was open. Somewhere, not far from the Schmids’ place, lived a family named Thwing who spent summers on the Island. There was a cabin in the woods nearby in which there lived a man about whom there was much speculation. The story was that he was a Russian, a Nihilist or Anarchist, out of favor in the Czarist government. We did not know the straight of it, nor the outcome. One day he was there; then he was not, and that was all that was ever known. Father ran his dairy at the leased Calkins’ Place until 1902 or 1903. He kept a hired man. I remember two hired men: William Devenney and William Bohringer. Mother and we girls lived in Seattle during the school year and hurried to the Island to be there when the Royal Annes were ripe. The summers were full of work for us; still there was time to play. We had our own small dock and our own rowboat. Father taught me how to handle it and also his sailboat. Once I rowed all the way by myself to Leschi Park and often Ollie and I rowed Mother to call on ladies in East Seattle. Father crossed the lake daily except Sunday with milk, cream, cottage cheese, which I made, vegetables and fruits in season. In 1902 he bought a lot on 19th near E. Jefferson, built a nice house, disposed of his dairy herd and left the Island, regretfully. The house Father built on his 5-acre tract was a story and a half; with two rooms upstairs, three down, a front porch and a back stoop. It was never finished, even during our second residence there. The openings for the windows upstairs were raw. I don’t remember any glass. Downstairs there were real windows. The stairway was from the long kitchen. There were 17 steps. The kitchen was a good room, light, airy and homey. There was a long, homemade table, a square iron cook stove, an alcove for dish cupboards and a table below where dishes were washed. We threw the dishwater outdoors. The ceilings were high. We did not have a screen door. The Sandells in East Seattle did. I enjoyed hearing it squeak. To me, it was a token of elegance, as much as the piano they had in their front room. I have in my Renton home two pieces of furniture brought from Ohio to Wisconsin, later to Washington, that were in our Mercer Island home: a table and a hand-made high chair, both over 100 years old. Not far, just across the yard, was a large woodshed. Back of it, the barn, and to the side, a chicken house. Beyond was a field for pasture and this side, close to the house and stretching several hundred feet straight ahead to the road, were a garden and more pasture. A well, with unprotected rim, had been dug beyond the garden. Over the rim Ollie slipped one day. I threw myself on my stomach, thrust my arms out and caught her hands. Then I yelled with all my might. Just as my fingers were giving way, Mother came running. She fell face down, caught Ollie’s wrists and drew her up. We had to rest before we could stand up. There was no way, without installing a pump, which was an expense that was out of the question, that could be done to prevent a reoccurrence, so unnecessarily we were warned to stay away from the well opening. Our living there was almost at its end anyway, for the caretakers of the Calkins’ Place, three-fourth of a mile away along the lakeshore, were moving away, and Father was leasing the place. So the Island, as I knew it, had three small settlements, or four, if the Olds property is thought of as separate from the Lucas-Schmidt community. No one I knew of lived between that and East Seattle. There was no one between us and Lucas-Schmidt. I can remember some of the residents in East Seattle; there were two families named Sandell, one family named Peterson; there were the Pidducks, the Delpays, the Workmans, all to the left and rear of the big hotel. On the other side were the Hilts and the Squires; then, a half mile or so beyond on the lake shore lived the Devines and Mrs. Parmalee. I do not know how they earned their living. All had gardens; some had cows and pigs and chickens. There were no stores. Trading was done in Seattle on Occidental Avenue and First Avenue. Groceries were carried on backs, over shoulders, to the Yesler Cable cars in gunnysacks, sugar or flour sacks. Flour sacks made underwear. Sugar sacks were not used as dishtowels because they were not absorbent. They made good quilt and comforter backs. A trip to town was an event much discussed fore and aft. When Mother and Father left the three of us for a shopping spree in Seattle, the day was long. Sometimes they took the L. T. Haas instead of the sailboat. The shopping center then extended from Occidental Avenue up First and Second a bit beyond Madison. Beyond Madison, the big store was Spelger and Hurlburt’s on Union at Second. The Bon Marche was on Pike and Small. The nicest stores were Baillargcon’s on Second and James, MacDougalls on First and Cherry or Columbia and Frederick Nelson and Monro on Second at Madison in the Rialto Building. My father was gregarious. He probably was lonely on the Island. That may be the reason he was always bringing people home with him from Seattle. I remember the Hertzogs, a young couple he met and assured them of a welcome from Mother, who turned up with him one day. It turned out a very good thing. The living room was made into a bedroom for them by fixing short posts in a corner; one on the wall at the head, two on the wall; the fourth was nailed to the floor. Then two-by-fours were nailed to the ends of the posts and springs set on the frame. After that it was simple to make the bed. Mrs. Hertzog fitted in with Mother nicely in the house. Early in the fall, Mrs. Hertzog had her baby boy. Ollie and I went to bed in our own bed, but work up in a strange one, asking how we had gotten there. We were shown the new baby and upon discussing the matter privately, we decided he had something to do with the switch. The last of December we had the same thing happen while we were asleep. The next morning, Father took us to see a new sister. The Hertzogs were with us for several months; we liked them. I wish they had kept in touch. Our next guests were Italians named Colella, fresh from the old country, father and two sons, lonely and lost and sad because they had no work. No work, no money. No money to send home to pay passage to America for the wife and mother and younger children. Father could only fix them a place to live. He went to work on the big woodshed to make it tight and weatherproof. He got a cook stove from somewhere, somehow, maybe from an abandoned logging camp. Beds were fixed in corners, box cupboards put up, windows with glass, the floor smoothed and the Colellas moved in. The three men got work somewhere – at 5 years of age, there are matters one does not understand. Ollie and I enjoyed their accordion and songs. We came to understand what they said and I suppose they learned our simple, limited vocabulary. Months, months later, Mrs. Colella came alone; the children followed when it could be afforded. That was after the family moved to Seattle. At one time they had a large produce garden on the corner of 12th and Yesler and later they moved to Rainier Valley across from Sick’s Ball Park, but years and years before his time. The Colellas always called our Father Mist’ Pet, a corruption of Putnam, which they could not handle. Our families kept in touch for many years until the new generation changed along with times. I think that C.C. Calkins was a man who was ahead of his time. When he saw Mercer Island he must have been impressed by its potentialities. Not everything he hoped for it and planned toward has come to be, but part has. He saw fine homes and spacious yards and fine gardens and orchards. He began at East Seattle. He laid out a town site that was to be a resort for wealthy people. He built that fine hotel. Three floors, verandas and balconies, towers and more porches, a grand staircase, a big hall, a ballroom, a fine kitchen and large dining room and bedrooms on two floors. It was empty for years. Ollie and I knew a window we could push up and climb through. We visited every room again and again. The ceilings of all rooms except the kitchen were plastered in fancy ways with cupids and baby angels and flowers with scrolls and curlicues and all painted. The walls were covered with wonderful wallpaper with pictures in panels. The grand staircase was a sight to see. 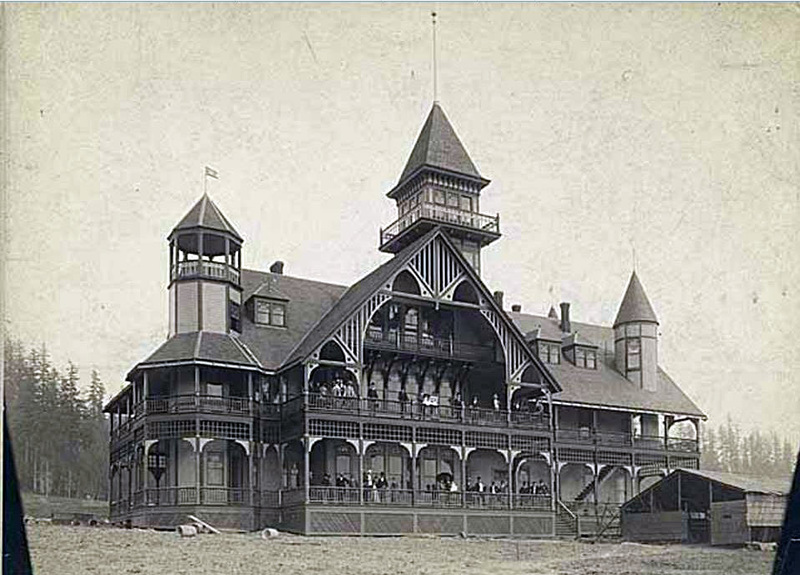 One could imagine fine gentlemen and ladies parading the verandas and balconies, going up and down the wide stairs. We never were there to see any of that, for the hotel was not operated during our residence on the Island. I do not know if Mr. Calkins owned the town site and buildings in East Seattle; probably a company he promoted did. He did own a homestead – the site of the boys’ school. The homestead included the five acres he sold Father. The road from East Seattle my Father laid out ended at a corner of the homestead. It was built primarily to afford easy land travel between the two. On the long stretch of land ending in the sharp point of land at the western limit, he laid out a big pasture for a small herd. Along the pasture, but fenced off, next to the shore he planted an orchard. There were apples; an early Transparent variety, Gravensteins, later ones whose names I did not learn, and there were Waxens with fleshy stems and some that were good keepers. There were Bartlett pears and Seckle pears; Royal Anne cherries and Black Republicans, Italian and French prunes, big egg plums and some small blue ones. I remember raspberries, currants, gooseberries and wine berries. There was a long double row of grape vines. There were bees in hives, rows and rows of rose bushes, many shrubs and trees. Father said many varieties were imports. There were graveled walks and lawns around the brick house we did not see because it had been destroyed by fire. Where it had been was obvious. Mr. Calkins built a fine large barn and two smaller buildings just like it close by. They had central towers and gables. Behind the mansion he built a six-sided building to house a planting, potting shed and a reservoir on its third floor. Attached to it was a long greenhouse. Beyond the greenhouse was a fancy birdhouse – red and white, almost a copy of the big hotel. The bird house was so large that I had no trouble walking around the lowest veranda, only I was obliged to set my feet down one directly ahead of the other. No one saw me up there. I saw to that first! It was a matter of balance! Mr. Calkins had a wife and a little girl names Ruby. The second child, also a girl, died after birth. Mother was given a trunk of baby clothes for our sister Lucy. Mrs. Calkins took Ruby and went on a trip somewhere. While staying in a hotel, Ruby lost her balance at an open window and fell out. Before Mrs. Calkins could rejoin her husband on Mercer Island, the mansion burned. These disasters quickened her death. I do not know the story from then on. Whenever Mother ran short of glasses for jelly, she learned how to tie a string that had been dipped in kerosene oil around a bottle, set the string on fire, let it burn clear around, then tap the bottle sharply. Usually, it broke off clean, especially if it burned evenly. Mother detested our well water. She would not drink it, nor would she drink lake water. About a good half-mile from the house, down the hill to the right and beyond the flat place there was a hole in the trees where a rotted skid road went off into dark woods along the lake. To me it was scary. Go along that trail at noon. It was like evening. Father had found a fine spring over there. He dug a place out and fixed a trough for the clear cold water to run in. That water Mother liked, but she would not go after any. She sent me. Two 5-pound lard pails with handles would be handed me. Oh, the misery alone in that tunnel. The wood noises made by things I could not see, only hear; the hard time on the uneven trail to keep the water from spilling – I feel the suspense and scariness still. Once in a while I dared to slip down to the lake instead. Another task I disliked was filling the lamps, trimming the wicks then washing and polishing the chimneys. I remember the clock matches. What a nose-burning, eye-watering smell a struck match had. Once in a while and only once in a while, I could light a match without that smell. Whilst [a friend of Father] was in Wyoming, our Father visited him. Liking the country and curious about the territories westward, he made his way gradually to Seattle, arriving late in 1888 or early 1889. Casting about for work, he heard about C.C. 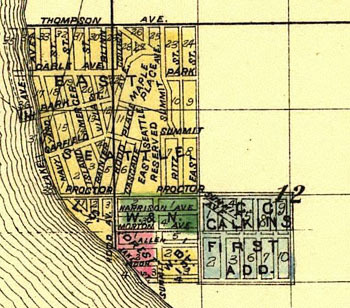 Calkins’ activities and interests in East Seattle, interviewed him and was taken on to layout a road from East Seattle to the homestead across the Island. In late fall 1889 my Mother, Ollie and I journeyed westward from Maiden Rock, Wisconsin over the Northern Pacific Railway to Tacoma, where Father met us. We completed the trip to Seattle by boat, and to Mercer Island next day by boat (a small steam boat.) We were on the Island until the fall of 1892 when we returned to Maiden Rock so that Father could care for his father, ill, who died the following fall. 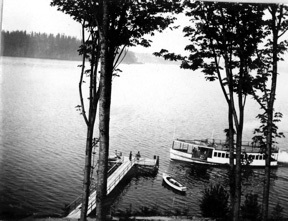 We returned to Mercer Island in December of 1894. We left the Island in 1901 to live in Seattle. Not long afterward he moved to Whidbey Island. He died September 23, 1931 and is buried in Valley View Cemetery, Coupeville. On December 12, 1887, the Harper family came to Seattle their first home was a rented house on 9th and Pine belonging to a man named Brazier. 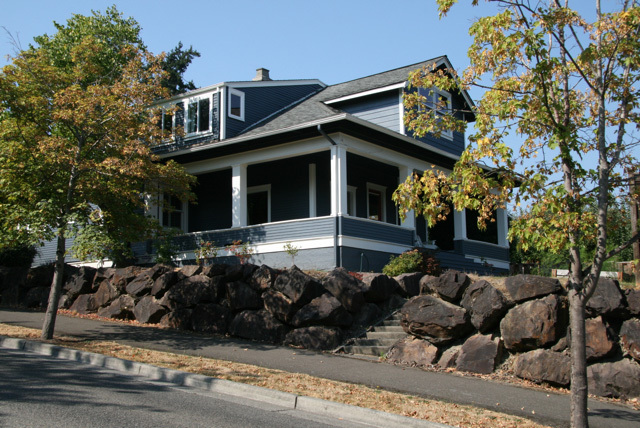 Shortly Mr. Harper purchased a piece of property on the slope of Queen Anne Hill and built a house there. The family still owns the house and Mr. Paul C. Harper lives there now, continuous residence since 1888. 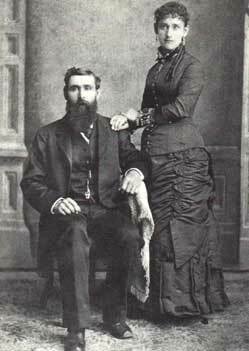 During the first year 1887-1888, the Harpers became acquainted with Mr. and Mrs. Calkins. They must have liked each other, because the Calkinses invited Mrs. Harper to visit them on Mercer Island and bring her three children. They stayed three days. Mr. Paul C. Harper remembers that they stayed in a big log cabin and were kept awake all night and apprehensive because of the wailing cries of a cougar. He was 7 years old, but he does not remember how the Calkinses looked nor anything about them. He says that no doubt the panic of 1893 wiped Mr. Calkins out. He does not know where the Calkinses came from nor where they went. Mr. Harper says that at one time, 1903, he bought a tract of land, 800 feet lake frontage continuous to and just beyond the school property for taxes. In 1906 he built a home there and lived in it summers until 1927 when he sold part of it to Paul Pigott. That property was between my Father’s five acres and the lake. The big red brick mansion must have replaced the log cabin Mr. Harper remembers. I suppose that I saw it because my parents also visited the Calkinses. Mrs. Calkins and my Mother were expecting babies in 1891. The Calkins baby was born first and lived a short time. Mrs. Calkins gave my Mother a trunk full of baby clothes, beautiful, dainty garments; some were convent-made. I remember one dress with St. Gall embroidery. I remember, too, a suit of clothes Mr. Calkins gave my Father, who enjoyed wearing it so much he wore it as often as he could. I recall hearing my Mother say, “You ought to give that suit a rest now and then, but that’s the way you are. When you like a suit, you won’t wear anything else.” Funny, isn’t it, what a child remembers? Mr. Harper told me that he attended the old Seattle High School on Seventh and Madison. He says that the favorite place for picnics and dancing parties was East Seattle, that a class would charter a steamboat, picnic in the park, and dance in the big hotel. He said he was there often. Wonderful parties, but he says he cannot recall whether there was furniture. But I am sure there was and that the chandeliers probably set with candles, were there. When my sister and I played there, years later, the chandeliers were not there.